One big trend that has become popular for families with a backyard space is to bring chickens to their yard. Raising chickens is not as hard as it may seem, and it is a unique way to help produce your own eggs or chicken meat. You could have tastier and fresher eggs if you decide to start your own flock. Then you must choose which type of chicken you want to have on your property. There are many different chicken breeds that also have a loving personality similar to a pet. Silkies chickens are one of the most dramatic-looking breeds, with a sweet temperament that has made them popular with chicken farmers. If you want a unique-looking and fun breed, Silkies chickens may be for you. The Silkie chicken was first bred in Ancient China. The breed became popular in the United States during the 19th century. With the recent resurgence of backyard chicken farming, Silkies are one of the top breeds that people choose for their flocks. Here are some additional Silkie chicken facts. Unusual Look – Silkies chickens are most known by their dramatic look. The chickens have black skin and bones. Their feathers are soft and resemble fur. Because their feathers are more like down, the birds are unable to fly. Lovable Personality – This special breed of chicken is one of the most beloved in the poultry world. They are friendly and calm, and they have a reputation as one of the tamest birds around. Egg and Meat Facts – Silkie chicken eggs are not as plentiful as other breeds of chicken. Hens may lay about three or four eggs per week. Their meat is darker than usual and offers a unique flavor to your dishes. Other Things to Know – Silkies do well in winter temperatures, and they don’t mind being contained in their coop on smaller properties. Because Silkies chickens are more apt to stay close to their coops, it’s important to make sure their space is ideal for their health and contentment. You want to keep your exotic birds safe and comfortable in an environment that allows them to thrive. Here are some ways you can make the perfect space. Food and Water – When you’re putting your coop together, be sure to find a spot for your chicken’s food and water. Keep out debris and dirt by elevating the dishes a few inches off of the ground. Cleanliness – It’s important to have a system that allows you to remove droppings regularly to prevent disease. You should also make sure that the floor area is not accessible to rodents or other small creatures. 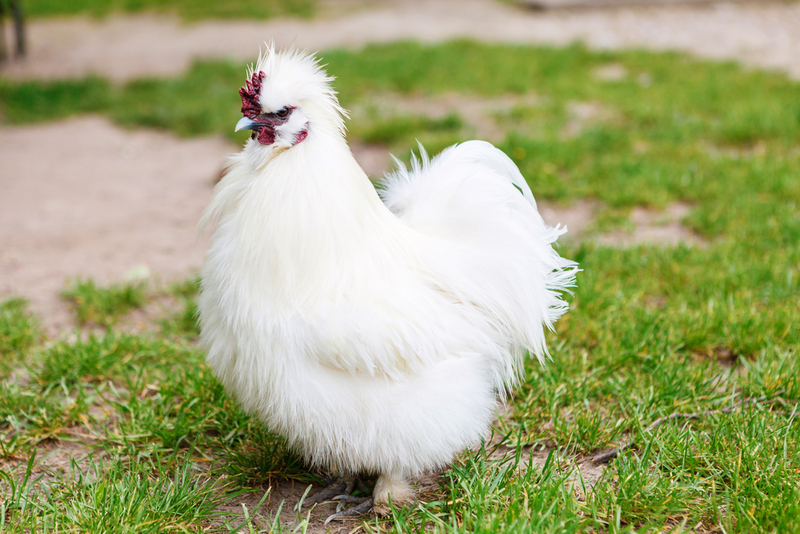 Safety for Your Flock – Avoid making your flock of Silkies Chickens a target for predators like foxes, dogs, wolves or raccoons. Equip your coop with protective chicken wire to help keep these animals away. Enough Space for Your Chickens – Even though Silkies like being in their coop, they still need a certain amount of space to be healthy and content. For birds that spend most of their time in the coop, that’s 10 square feet per chicken. If you let your chickens forage around your yard, you can give them four square feet. Sufficient Air Circulation – In order to prevent respiratory illness, make sure your coop has enough air flow. Also provide some sort of insulation against the elements when the weather gets nasty. Raising Silkies chickens is one way to bring joy and fun to your backyard, while the chicken farming lifestyle provides a constant source of fresh eggs in your home. By choosing Silkies, you can look forward to enjoying a vibrant flock of exotic, friendly birds.